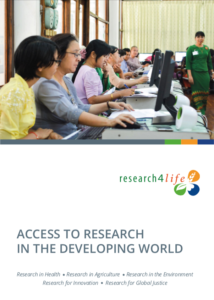 Partners can now access Research4Life promotional materials through this private link. 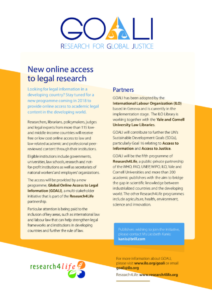 Files include logos, posters, booklets, boiler plate text, and other resources. You may have trouble viewing this in Internet Explorer 8. Please try another browser to download documents effectively. 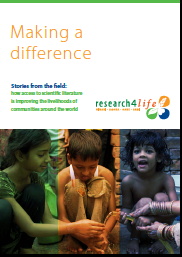 The Unsung Heroes booklet can be downloaded for online and offline use. 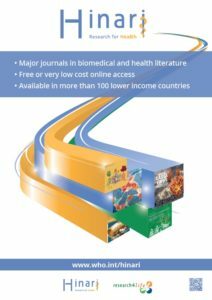 Beyond the 2015 Horizon was published in 2011 and was based on the findings and recommendations of detailed external reviews conducted during the previous year. 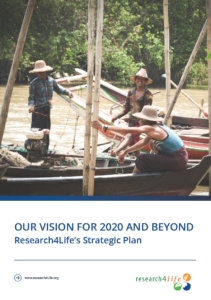 In addition to outlining the five strategic goals which form the heart of our strategy for the next five years, the document also summarises a wide range of basic information about Research4Life, its provenance, mission, and modus operandi. 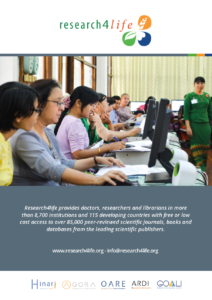 How Access to Scientific Literature is Improving the Livelihoods of Communities Around the World. 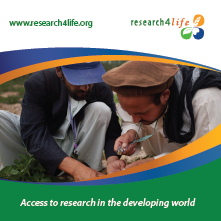 A small and foldable brochure containing information about research4life and the four programs. Comes with an insert with a list of eligible countries. 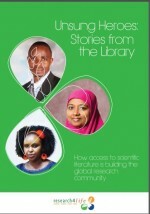 Available in different languages. Print version are high-res files with bleed marks. Web versions are low-res and to read online. 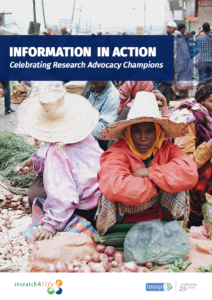 Factsheet with basic information about the program. Foldable Brochure with general information about AGORA. 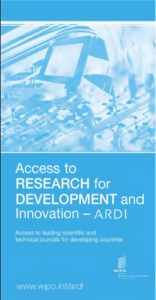 Foldable Brochure with general information about ARDI. Brochure with general information about GOALI. 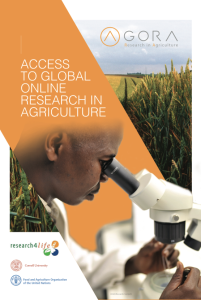 A collection of four adverts in landscape format to promote Research4Life online or to be printed. 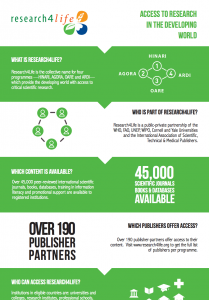 A collection of four adverts in portrait format to promote Research4Life online or to be printed. 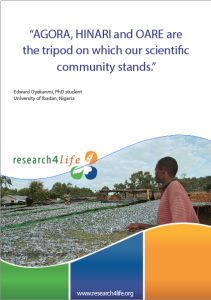 A collection of four banners with inspiring quotes from Research4Life users around the world. 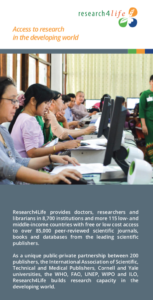 Below are various banners, which can be used online by Research4Life Partners. 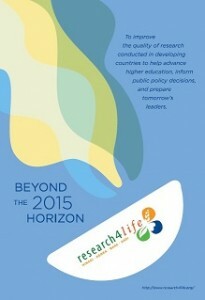 A standard A2 poster to promote Research4Life. A pull-up banner to print for conferences and stands. 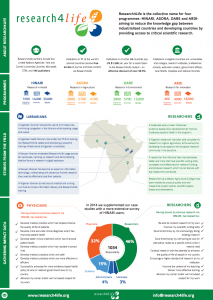 An infographic poster with basic R4L information. 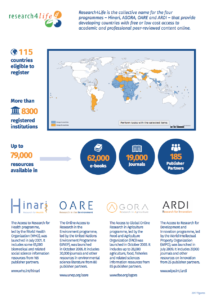 A poster with basic R4L information and a visualization of the Hinari impact survey results. 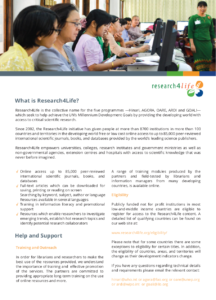 A general poster presenting R4L’s Hinari program. 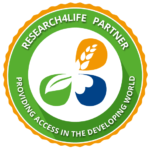 Please use these files to update your R4L logo as from 2015. Place this badge on your website and show your support as a Research4Life partner.